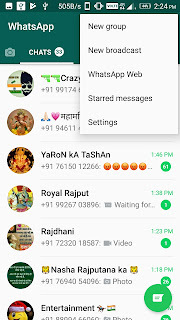 YEH TO JAAN LIYA PICHLE POST MEN KI WHATSAPP ACCOUNT HACK KESE KRE, PAR ABHI TAK YEH NHI JANA KI AAPKA WHATSAPP HACK HAI YA NHI YE KESE PATA KARE. AAPKA WHATSAPP ACCOUNT HACK HAI TO KESE HACKING SE HTAYE AUR FUTURE MAIN HACK SE KESE BACHE. 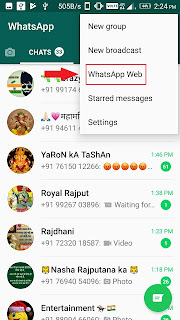 ES TRICK SE KOI BHI AAPKE WHATSAPP ACCOUNT KO HACK KAR SAKTA HAI. ESLIYE KIS TARH SAMBHAL KE RHNA HAI ESKI JANKARI BHI AAPKO HONI CHAHIYE. WHATSAPP WEB KO OPEN KARNE PAR AGAR AAPKE MOBILE KA CAMERA ON HO JATA HAI. YA OKGOT IT LIKHA RAHTA HAI TO AAPKA ACCOUNT HACK NHI HAI. AAPNE UPAR PADHA KI HackHAI KESE PATA KAREAB JANIYE HACK HAI TO USE HTAYE KESE. AGAR AAP ACCOUNT HACK HO RAKHA HAI TO WHATSAPP WEB MAIN JAYE WAHA LOG OUT LIKHA HAI US PAR CLICK KARE DE. THODI DER PROCESSING HOGI AUR AAPKA WHATSAPP SAB JAGH SE BAND HO JAYEGA AUR SIRF AAPKE MOBILE MAIN ON RHEGA. kindly contact, cyberhackingservices@gmail.com his name is Philz or call +1 516 908 0046 call he’s a computer engineer and a cyber guru involved in different types of hack. I have used his services before and he saved me from the lies of my cheating spouse with proof. He deals with diff types of hack Facebook, whatsapp, phone, gmail, hotmail, grades, database, websites, domains, database to mention a few. I recommend you contact him for any other hacking related problems. I can’t stop appreciating him.